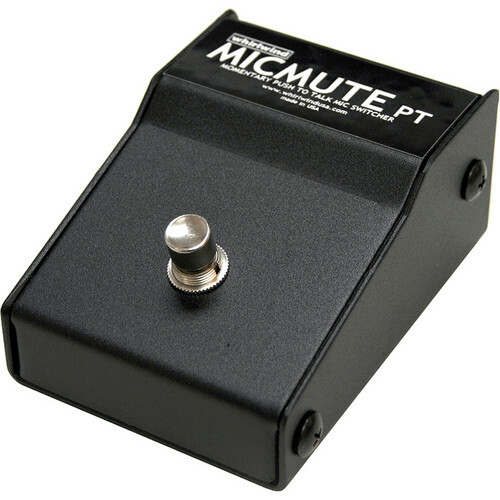 The Micmute PT from Whirlwind is a compact pedal-style push-to-talk switch that provides quick and easy control of a mic or line audio signal. The rugged metal housing offers XLR input and output connectors for wide compatibility. When the heavy duty footswitch is pressed and held down, the Micmute will allow the audio signal to pass through. As soon as the switch is released, the signal is broken and audio is silenced again. The Micmute is entirely passive, requiring no power. Box Dimensions (LxWxH) 7.1 x 6.9 x 2.0"
Micmute PT Push-to-Talk Switch (Pedal) is rated 5.0 out of 5 by 1. Rated 5 out of 5 by Voice of the Flashes from Just what the doctor ordered! I am a public address announcer for our city's high school basketball and football games. The Micmute PT works perfect with my headset. It allows me to speak and write at the same time during the game without holding a microphone. I had a similar style pedal switch but like the Micmute PT better, no doubt.